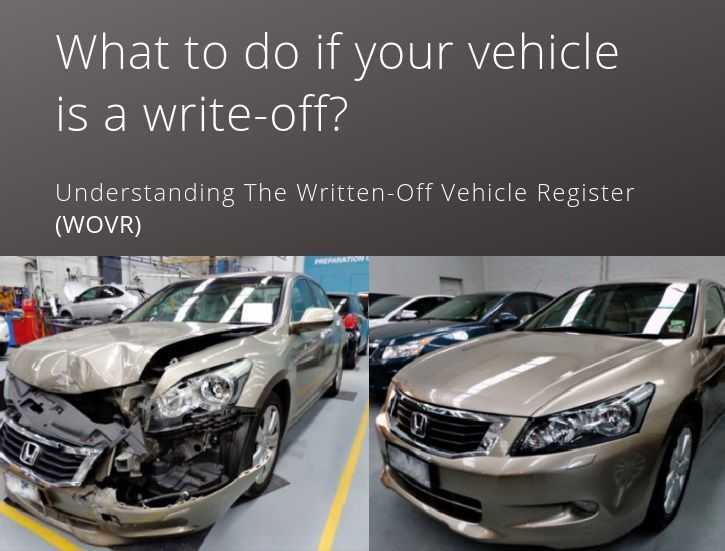 What is Written-Off Vehicle Register & How to avoid a written off car? Whenever an insured vehicle is damaged, the extent of the damage must be assessed to work out how to proceed. Can the vehicle be repaired easily? Is it economical to repair the car? Or is it simply too damaged to ever safely work again? If the damage is too severe, the insurance company will declare the vehicle a “write-off”. They won’t pay to fix it, they won’t replace it — instead, they pay out the insurance to the owner, less premiums and registration. You might think that a vehicle that’s written-off is entirely un-roadworthy, and can never be sold as anything other than scrap. Statutory or non-repairable write-offs simply cannot be fixed, no matter how much money is thrown at them. This is what most people think of as a write-off. Repairable write-offs are ones which can be repaired, but which are not economical to do so. The insurance company decides that the cost of repairing the vehicle is greater than the vehicle is worth. Sometimes an insurer will return a repairable write-off to the owner; many times they will try not to. It’s entirely possible to see a repairable write-off back on the market after repairs are made. The suspension is damaged, and at least 2 areas of the structural frame are damaged. A motorcycle is fully immersed in salt water for any period. A vehicle is burned to such an extent that it is only fit for wrecking or scrap. Has been stripped of all, or a combination of most, interior and exterior body parts, panels and components. A vehicle has excessive structural damage if three indicators are found in the vehicle. (Indicators are listed in the ‘Damage Assessment Criteria for the Classification of Statutory Write-Offs’. A vehicle has excessive water damage if the internal cabin of the vehicle has been inundated with water (irrespective of whether the water is fresh, brackish or salt water) to a level above the level of the inner door sill. This raises many issues for those looking at second-hand cars. A repairable write-off must pass rigorous checks to go back out on the road, but how long will the repairs last? What needed repairing? And since it’s been written off before, how much can you insure it for now? Sometimes it can be easier to just not buy the car and look elsewhere. But how do you find out if a car you’re looking for is written off to begin with? The WOVR is a national initiative whereby states and territories must declare written-off vehicles on a national registry. Each state and territory has different legislature regarding the registry process, but the end result is the same across the nation: a vehicle that has been declared a write-off for any reason is listed on the WOVR. This information is then publicly accessible to anyone looking to buy a used vehicle. The register only covers cars, bikes, trailers and caravans 15 years old or younger. Older vehicles aren’t listed on the register. To access the information on the WOVR, you need to get a report from the Personal Property Securities Register, or PPSR. A PPSR report, also known as a VIN check or a car history report, contains comprehensive information on the vital statistics of vehicles registered in Australia. This includes the make, model number, engine part number … and write-off status. If a vehicle is registered on the WOVR, you will find the relevant information on the PPSR report. It will tell you of the type of write-off, and whether the car has been repaired and deemed roadworthy again. You will be able to see what was damaged, the type of damage, and assess how it was repaired. It’s always recommended to get a mechanic or driving club such as RACQ, RACV, etc. to check a used vehicle prior to purchase. It is entirely possible for a car to be declared a repairable write-off, be fixed, and made perfectly roadworthy again. So, if you discover that a car was previously written off, it’s not necessarily a reason to abandon considering the vehicle. For example, take an inexpensive but older vehicle that gets run into in a parking lot. There’s not much damage, just a bent rear fender and a busted tail light. An insurer might decide that it’s not worth paying for this fix, and instead pay out of the insurance. They will immediately cancel the vehicle’s registration and list the vehicle on the WOVR. The owner of the vehicle can apply to get the car returned to them to perform the fixes. Since the problems are largely cosmetic, it can be fairly easy for the driver to make the changes and get the vehicle roadworthy again. Of course, a vehicle that underwent more substantial damage might be more at-risk of breaking again. Or the repair work might have undervalued the car below what the seller is asking for. When faced with a repairable write-off, you need to take initiative in assessing what was damaged, the extent of the damage, and how well you feel it was repaired. In some cases, it might just give you better peace of mind to just walk away. Getting a PPSR report and checking on the status of a vehicle is simple. Simply visit any page on our website and enter either the car’s VIN or registration number. After paying a small fee, you’ll get a comprehensive PPSR report sent to your email. You can even get a simplified version sent to your phone for easy reference. With a car history report in hand, you give yourself the best bet when it comes to purchasing a used vehicle. Private sellers are not legally obligated to inform you whether the vehicle they’re selling is on the WOVR. It’s up to you to take the initiative and check the vehicle’s history … or else wind up with an expensive, broken lemon.